PREDRAG K. NIKOLIC is an Associate Professor at the Cheung Kong School of Art and Design, Shantou University, in China. He is an interaction designer and an interactive media artist who holds a Ph.D. in Digital Media. His research focuses on intelligent interfaces, robot creativity, machine-made content and design for behavioral changes. He mixes experiential reality, artificial intelligence, and responsive environments to engage an audience in new types of interactive experiences and media perceptions. His design and artworks, such as MIndCatcher, InnerBody, Ciklosol, Before & Beyond, Vroom, Robosophy Philosophy, Digital Lolipop were exhibited worldwide and presented at the Ars Electronica, SIGGRAPH, SIGGRAPH Asia, Technarte, Singapore Science Center, Hong Kong – Shenzhen Design Biennial, Maison Shanghai, National Museum of Applied Art and National Museum of Education in Belgrade, etc. Before joining Shantou University, professor Nikolic was Dean of the Faculty of Digital Production in Novi Sad, Global Digital Director at Grey Worldwide Dusseldorf, Global Digital Director at J. Walter Thomson Worldwide Dusseldorf, Global Head of Digital at Ogilvy Greece, Head of Digital Marketing at Groundlink New York and Managing Director at JadePremier London. 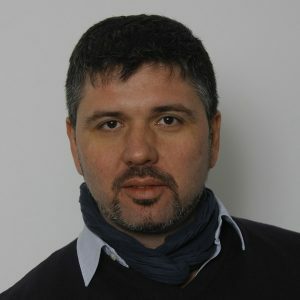 Predrag K Nikolic has published numerous research papers on the art of AI sense, machine-made context art, design for behavior change, collective creativity, mix-experiential reality, multi-sensory interfaces and usage of interactive everyday objects in smart living environments, interactivity and interface design. He lectures at universities, international conferences, symposium and serves on many conferences committees. In the project Syntropic Counterpoints, we are using discussions between Artifical Intelligence clones to generate creative content. Nevertheless, our focus is less on content analysis and more on the beauty of creation itself and given context by the machines. We are using a different recurrent neural network (RNN) and collective creativity approaches to support interactions between Artifical Intelligence clones and trigger a humanless creative process which should lead to unsupervised robot creativity. The robots are trained by using the publications of some of the greatest thinkers of their time such as Aristotle, Nietzsche, Machiavelli, SunTzu and confronted to the crucial questions related to humankind such as understanding of moral, aesthetic, ethic, strategy, politics etc. Throughout this robot-robot interaction model, we are trying to investigate the possibilities and consider limitations of using artificial intelligence in context-based creative processes as well as to raise questions related to potential future phenomena of machines mindfulness.